Pull-up Banner - Just £45! ​Buy roller banners or roll up banners at cheap prices from Poster Pigeon. Roller banners are easy to set up and popular for marketing. Come, order and get high-quality banners from your advertisement. Contact us on 0845 8502353 for details and to find out about exclusive offers. A Fantastic Roller Display Banner - an ideal budget display solution designed with the price conscious in mind. Simple twist out foot design. 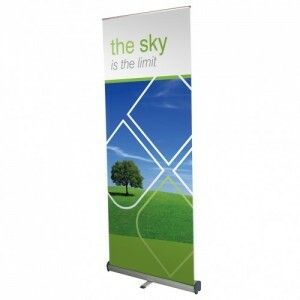 The adjustable telescopic pole set makes this roiller banner ideal for floor or desktop display. 800mm wide, single sided graphic only. Includes full colour graphic panel. To make things more easy to read, we also offer some dedicated spotlights which you can specify when you place your order - Go-on Make and exhibition of yourself! A NOTE ABOUT ARTWORK - You can choose to upload your artwork file using the "upload files" button on this page or choose to upload your artwork to Dropbox. (once you have placed your order we will create a folder and send you a link via e-mail). For more information about how to set up your artwork to ensure that your roller banner is perfect see our helpful guide.